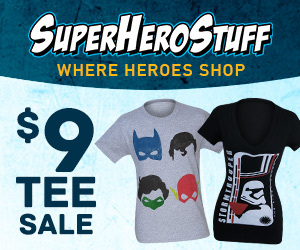 SuperHeroStuff: $9 T-Shirt Clearance and many more on sale - Blog @ That Awesome Shirt! We have searched the multiverse to find the best T-Shirts to give you. Enjoy a $9 T-Shirt sale this week as well as other deals. These tees are at their best price possible, you don't want to miss out. Also, we have 300+ shirts and accessories for up to 50% off! Use the code to get 10% off non-sale items.